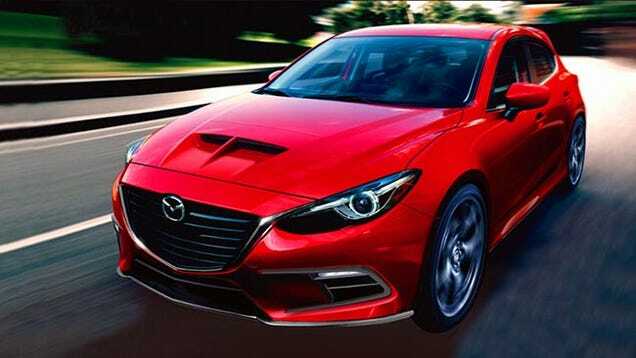 New rumors have surfaced suggesting Mazda's next-generation Mazdaspeed3 could arrive with a turbocharged engine and all-wheel drive. The latest report is in stark contrast to previous rumors - in July it was reported that the next Mazdaspeed3 would ditch its turbocharged powerplant altogether for a more powerful version of the automaker's 2.0L naturally-aspirated Skyactiv mill. However, Australia's Drive is now claiming that the new Speed3 will retain its boosted motor. A turbocharged engine would match up more closely with other hot hatches in the segment, such as the Volkswagen GTI and Ford Focus ST. Although it sounds as if the Mazdaspeed3 might hold onto its turbocharged engine, the pocket rocket's infamous torque steer could be put to rest. The latest Mazda3 is built on the same architecture as the CX-5 crossover, meaning it would be fairly straightforward to equipped the Speed version with all-wheel drive. "From a technical point of view it's not difficult to install a four-wheel-drive system," Mazda3 deputy program manager Takeo Mariuchi said. Mazda is mostly keeping quiet on the future of the Mazdaspeed3, but expect to see a new version of the car in showrooms within the next two years.